First of all, I apologize for being so late for posting on here today. I arrived in Indianapolis at around 11:30 and stopped off to check into the hotel. By the time I got to the track, Practice Two for the Verizon IndyCar Series was just about to get underway. I wandered down to Stand J, so that I could watch the cars coming down the long straightaway and make the sharp right-hander heading into the road course portion of the circuit. Here is a video I took from Practice Two. These are considered some of the best seats in the house for the Grand Prix. It was also a nice homecoming for me being down there. It was the first time I’ve been in Stand J since my first Indianapolis 500 in 1965. It’s hot here today. I was sweating heavily while out there. My phone says it’s currently 83-degrees, but it felt hotter than that while I was out there. It will probably be hotter than that when IndyCar qualifying takes place at 4:30 EDT. I got to ride up the elevator with Bobby Rahal and David Letterman. No, I didn’t try and schmooze with either of them. I gave them their space. They were headed to a press conference in the IMS Media Center where they announced a partnership to benefit veterans. 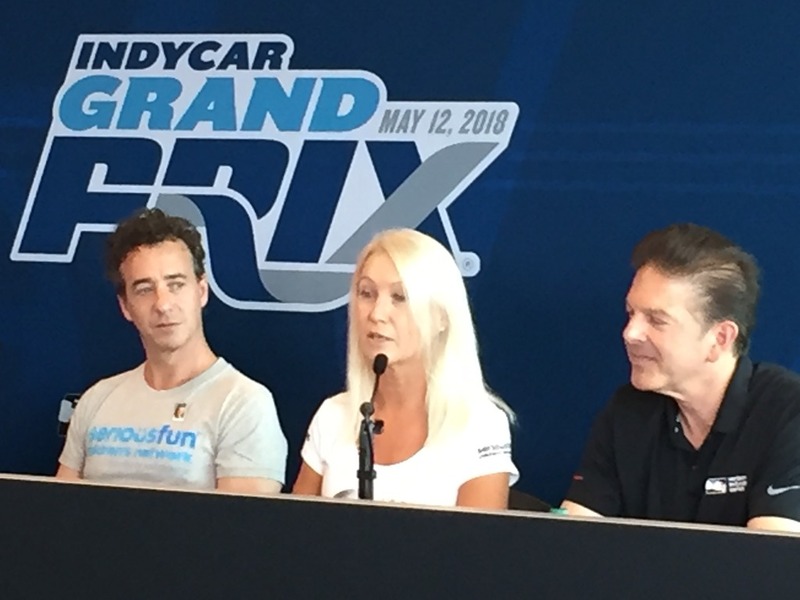 As I type, there is another press conference going on with Claire “Clea” Newman, daughter of Paul Newman, to announce a new partnership between IndyCar and SeriousFun Children’s Network. Just after the IndyCar practice, there was an Indy Lights race that was won by Colton Herta. Currently, there is a US F2000 race going on. I am about to head to the garage area to watch teams make last-minute tweaks to their cars. I will be back here after qualifying. You can follow me on Twitter for photos and videos at @Oilpressureblog. You may also follow Susan at @MrsOilpressure. Please check back later. This entry was posted on May 11, 2018 at 1:57 pm and is filed under IndyCar. You can follow any responses to this entry through the RSS 2.0 feed. You can leave a response, or trackback from your own site. George, Stand J was my viewpoint for the 1967 race, the third I attended. I still remember seeing the turbine car go wide going into Turn 1 (you couldn’t miss that red, even through the dust and turbulence created by the rest of the field) then having to wait to see who was the first to appear at the end of the Back Stretch, because we couldn’t hear the PA and this was long before the video boards. Parnelli already had a sizable lead over Mario, who had started on the pole. what does Letterman look like now? Thank you so much for mentioning the partnership between IndyCar and Paul Newman’s daughters, the “Serious Fun Children’s Network”. Paulie has left a lasting legacy as a racer, as a sponsor, as a father, and as a human being.